So, yesterday there was a package in the mail. Exciting!!! I knew I hadn’t ordered anything as I tore into the package. 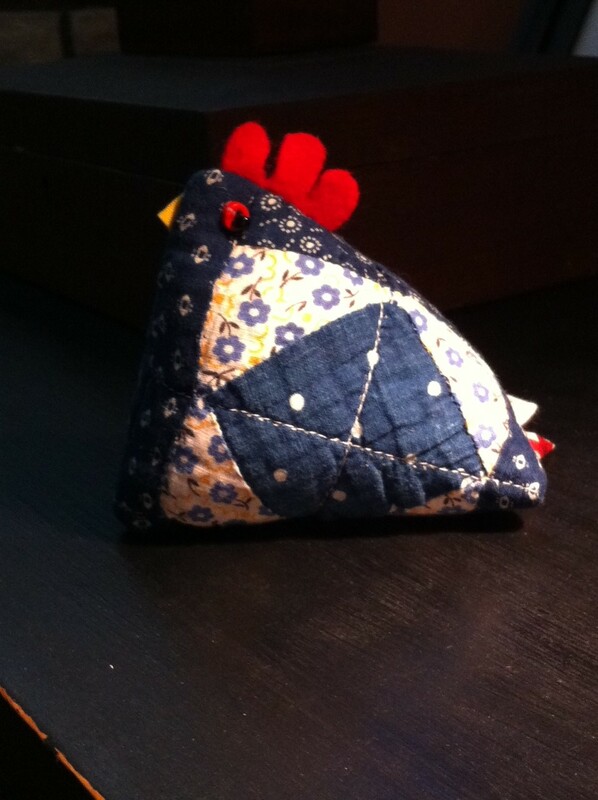 Inside was this charming chicken pincushion to roost by my nest in the family room. . Linda Klonz from San Antonio, TX sent this as a thank you gift. It is crafted from an antique quilt block with tiny little black beads for eyes. I have secretly lusted after one of these from when I first saw the pattern. But I was always too busy to make my own and never found one to buy that I liked. This little guy is so perfect, his feathers are the exact shades of blue and red in the family room where my nest is. I belong to some yahoo groups that talk about the great vintage Singer sewing machines I use and collect. A recent topic was retro fitting a Singer cabinet for a long bed Singer 301/301a. Some of the experts said it can’t be done because of the length of the bed but never say never to a bunch of people who rescue these workhorses and use them. I was lucky enough to score an original Singer 301 long bed table from a garage sale recently. I offered the interested people a tracing of the cutout area and a brief description of how the machine sets into the table opening. A few people took me up on my offer so I sent a few off patterns in the mail. Linda had sent a thank you email and that was wonderful. I didn’t expect more. But an unexpected gift given from the heart is truly a treasure.